Fabio 1.1 - Make Your Bot! Fabio is a fab-able Arduino compatible microcontroller board. It has 6 analog inputs, 6 digital inputs/outputs, a serial port, and a controllable LED. The analog inputs can also be reused as digital i/o. Fabio is built around a Atmel ATMega168 microcontroller and other standard Fab Lab parts. 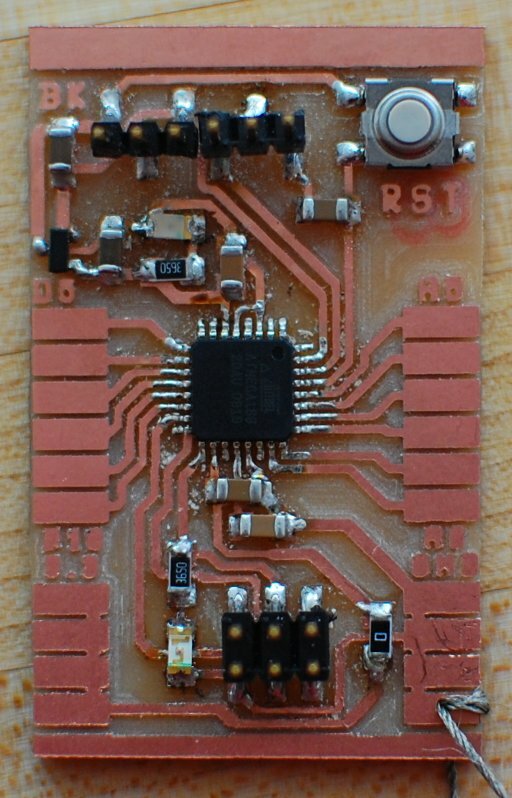 The board is a single layer PCB that can be milled using a 1/64th inch end mill. In fact, the Fabio above was created on a Mantis milling machine. The first step in creating Fabio is to mill a PCB. Any PCB mill like the Mantis, MTM-AZ, or Modella will do. 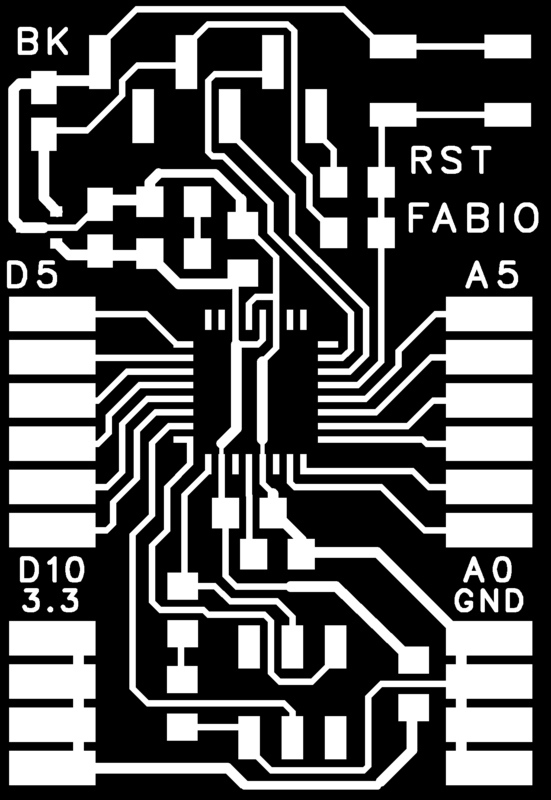 The Fabio PCB is designed to occupy one half of a 2x3" single sided PCB. With a little care, you can get two Fabios out of one board. If you're using the Modella, use cad.py to create a toolpath and run the job. If you're not using the Modella, then just download the G-code file above, and load .ngc file with EMC. From there, just zero the mill axes, and mill away! 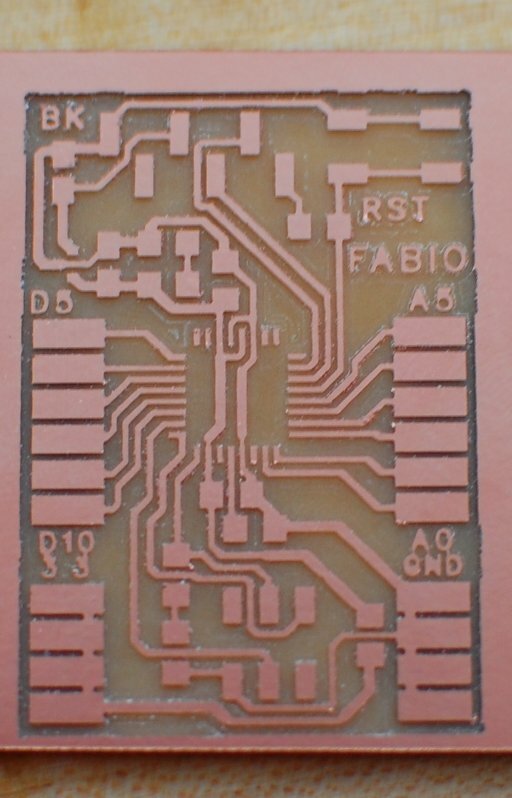 This PCB was milled on a Mantis V8 machine with a feed rate of 20 in/min and a spindle speed of 16,000 rpm. After your PCB is milled, use your finger or the edge of a ruler to remove any burrs or rough edges on the copper. If your board looks like the one above, you're ready to move on. Before soldering any parts, print out a copy of the part location diagram (above). Keeping this drawing handy will make sure your parts end up in the right places. Note that the microcontroller (U1), and the two diodes (D1, D2) have specific orientations. On the microcontroller, align the dot on the chip with the diagonal line on the diagram. The LEDs have a small green mark on one top edge. For D2, this mark should be one the same side as C2. For D1, this mark should be on the same side as the bottom edge of the board. 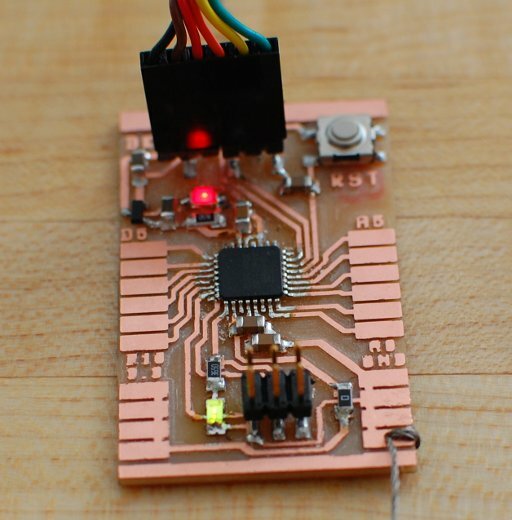 microcontroller (U1) - use plenty of flux! Fabio is powered through the connector at the top of the board. Usually a FTDI USB-TTL cable is connected to it, but anything that supplies 4-7.5V should be fine. If you're not drawing much current (less than about 60mA), then you can even directly connect a 9V battery. There are letters next to the connector to show where the BLacK wire goes. You can also reference the first picture on this page. When you plug in the cable, the red LED should light. If you don't already have the Arduino software installed, now is the time to get it. You can download it here. Unpack the the downloaded files into a location of your choice. Under the Tools menu, choose the Board sub-menu, and select "Fabio ATMega168 8MHz 3.3V". Then also under the Tools menu, choose the Serial Port sub-menu, and pick your serial port.